To many people, Longjing tea is an enigma. Without a doubt, it is the most famous Chinese tea. But few people have a satisfactory experience of drinking it. I love Longjing tea. It is the first Chinese tea I fell in love with. But I have to confess: my initial experience was good, but not exceptional. I struggled to understand why it ranks No 1 out of the 10 Famous Teas, and is even called the Queen of Chinese Tea. My breakthrough came in March 2007, when I received a sample from my friend HQ. His extended family owns 3 tea gardens in the most authentic part of West Lake in Hangzhou. When I tasted the tea, it felt like - finally - heaven opened its door to me. For the next 3 months, he taught me all the in-s and out-s of his Tribute Dragon Well tea. It was a revelation. The end result is this page, which reveals its long concealed secrets - for the first time – both in the East and West. The word "Longjing" means Dragon Well. So in English it is also known as the Dragon Well tea. The original tea comes from the Lion Peak Mountain in West Lake (Xihu). As its popularity grew, the tea is now cultivated throughout China. 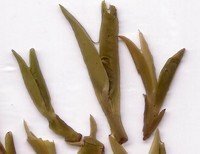 Today, any tea that is processed using the same technique is called a Longjing. This is where the confusion lies. When the 10 Famous Teas were created in the 1950s, there was only one Longjing tea - those grown in the Lion Peak Mountain and the surrounding area. Today, there are at least 100 different types of Longjing, not counting the fakes. Each year, it attracts extensive publicity in China and abroad. Read how someone pays $14,000 for just a handful of Dragon Well green tea. Like other high grade greens, Longjing tea is made of tender tea shoots. These are young buds, not leaves that you see in everyday tea. Can you see the picture to the right? This is what I call a "one-bud-and-two-leaves". The leaves are so young that they are no longer than the bud. In addition, the leaves are only slightly unfurled. They are tiny. One pick is no larger than 2 centimeters. One kilogram can have 80,000 of them. Tea shoots grow very quickly in the spring. There is only a short window of 6 weeks each year to harvest them. The first 2 weeks are considered high grade. The other 4 weeks are low grades. And that's it. Tea plants are then rested for the remaining year. Can you imagine: there are 365 days in a year, the tea plants are rested for 323 days. Contrast this with most other tea estates, who harvest their teas 3 to 5 times a year. With the exception of Japan's Gyokuro green tea, I am not aware of any other tea producing countries that follow such stringent harvesting requirement. Early spring crop is one part of the magic. 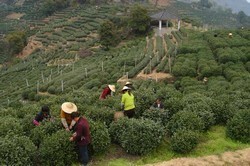 Other Chinese green tea follows the same harvesting pattern, so that alone doesn't make Dragon Well tea the No 1 green tea in China, or even the world. The other side of the story is processing. You see, high grade tea in China is still entirely handmade. Factories and machines still can't replicate the handicraft perfected hundreds of years ago. Picking Dragon Well tea is a laborious process. A good tea picker may harvest only 2 kilograms of fresh leaves in 10 hours. Making it is an art form that ranks among the most sophisticated in the world. A novice takes 3 years to master the complex "10 hands movements" and they roast not more than 1 kilogram a day. These "trained hands" are only found in the Lion Peak Mountain. Other tea producing regions simply can't make the necessary investments. Can you think of any other food or beverage where people go to such great lengths to perfect it? A 2004 study conducted by the UK Institute of Food Research analyzed 191 green teas from 6 different countries. The paper singles out Dragon Well tea as the "highest quality" and says it contains higher levels of theanine, EGCG (epigallocatechin gallate) and other active compounds. This is important. Theanine is the single most important indicator of green tea quality. It counteracts caffeine side effects and has a wonderful soothing effect. According to scientific studies, Dragon Well tea contains high levels of caffeine and EGCG - the two compounds responsible for green tea weight loss effects. You may be surprised to learn that although it contains high level of caffeine, a high quality tea is soothing rather than stimulating. 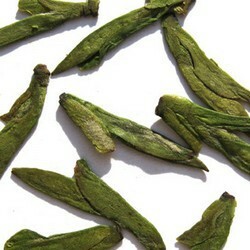 A high grade Dragon Well tea contains theanine, which has a wonderful soothing effects and is naturally decaffeinating. Ellen, lost 25 pounds in 6 months drinking Dragon Well tea. You can read her story here. If you are new to loose leaf tea, your palate may take up to two weeks to get used to its rich and complex flavors. Dragon Well tea is pan-fired - which gives it a delicious chestnutty aroma that is often described as high and lasting. The tea liquor is floral, with an exceptionally long, sweet aftertaste. A high grade does not taste weak, grassy or bitter. This is my visual impression in April 2007. West Lake Longjing tea is extremely rare. Consider this: Zhejiang Province produces 15,000 tonnes each year, of which only 6% comes from West Lake. To put this into perspective, the Indian Darjeelings, said to be the Champagne of Indian tea, produces a whopping 10,000 tonnes each year. West Lake has just 168 kilometer squares of growing area. Within this small area, it still boosts more than 30 varieties with varying degrees of quality. Longjing tea is not one, but many. That applies even to the highly acclaimed West Lake Dragon Well. The original Longjing - Lion Peak (Shifeng) - is grown in the high altitude area of Lion Peak Mountain. It makes up just a tiny proportion of West Lake's annual production. Can you imagine how sought after it is? First, know which Longjing tea variety you are buying. It makes a big difference to the price. Second, know when the tea is picked. This is quite tricky, as vendors often don’t know it themselves, and cropping date varies by regions. Cropping date is important, because it determines the grade. The earlier the crop, the higher the grade. The first picks are the fattest and sweetest, as they have been rested for a year. Third, if you are buying a West Lake variety, ask for an authenticity certificate. This won’t guarantee its authenticity, as tea gardens often sell fake tea with the certificates they have been issued. But any tea vendor worth its salt should be ready to provide one. Si Hai Gen (2000). ZhongGuo Mingcha Tupu: Luchapian. Shanghai Wenhua Chubanshe.